Correct Wheel Sizes, PCD, Offset, Rims and Tire specs for Mazda MazdaSpeed 6 series. A few things which can be added or changed here. 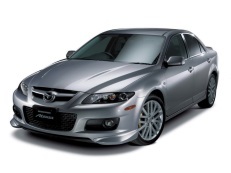 Firstly, the Mazdaspeed 6 was only made from 2006-2007 (although some early releases in 2005). Only 1 model, with only on optional extra (which is the built in sat nav, so not relevant for this!) so it is 2.3L engine, Power is 256bhp (stock), Only 1 generation, Wheel fasteners - Lug nuts, Centre bore is either 66.9mm or 67.1mm but cannot be 100% sure which.